4.2 out of 5 based on 98 bloggers and 18 commenters. 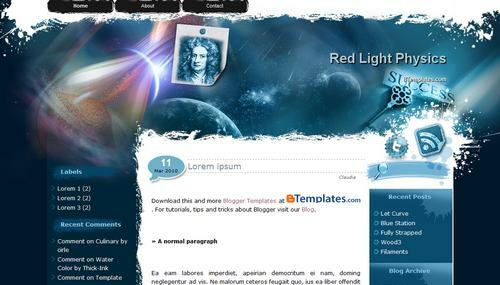 Red Light Physics is a free blogger template adapted from WordPress with 3 columns and left and right sidebars. Excellent template for blogs about education. Grt template but can I change the header pic to fit my blog pic? claudia thanks for replying, but I have another question, as I can add a new page and click it when you give a link fence and where it says “Home, About, Contact” Adding more and can go to another page? En ese nuevo menú puedes poner tus links manualmente, reemplazando el gato (#) por el enlace, y el texto “Edit” por el texto que quieres mostrar para tu enlace. Claudia Thank you very much that’s just what I wanted to change. Muchas gracias eso es justo lo que queria cambiar. The code that you mention does not have any relation with SEO, since it is just CSS. I mean, it doesn’t mattter if your text is blue, red, 14 or 16px. SEO is about improving post titles, including meta tags, and the usage of headings through HTML. I have upload this template on my weblog but opening it there is no template on. Would you mind help me to set this template on it? @Aghil You can find the answer to your questions and more in our FAQ section. What’s the easiest way to widen the post section? I don’t mind if it takes away from the sidebar. I am using your template. Thank You so much. I am from Kerala,India. You may not understand the language i am using in that blog. I am a physics teacher. My Blog name is “chalk Powder” represent teaching. Thank You. I need to give a header with picture. Is it Possible? ?